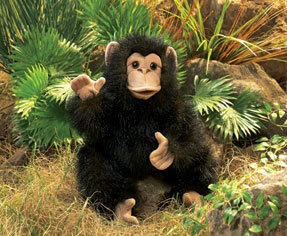 Folkmanis 2877 - This adorable Folkmanis BABY CHIMPANZEE is a hugable puppet that can be any child's best friend. With a movable mouth and sweet expression, he is fun for playtime, naptime or taking him on the road as a travel buddy. Measures 5” x 8” x 15”.